We�ve gone a couple articles about artistic miniature golf now without diving into a location where you�d actually expect to see art - a museum! This year two major museums featured miniature golf installations - Walker Art Center (the Walker) in Minneapolis, Minnesota and the Indianapolis Museum of Art (IMA) in Indianapolis, Indiana. It was the first year for the IMA to hold minigolf while the Walker has been holding theirs for several years, which 2016 seeing it on their rooftop for the first time. We�ve provided links to both events below and the IMA link has some pretty detailed overviews of the holes. However, we�re lucky in that I know two miniature golf fanatics who also happen to be artistically inclined and were involved with both events this year. A Couple of Putts (link to their blog below) follows Tom �Mr. Tee� Loftus and Robin �Pink Putter� Schwartzman as they document their minigolf journey and review various miniature golf courses. I reached out to them with a couple of questions and an edited version of their response is below and any errors are solely my fault. How did you get involved with these art installation courses? 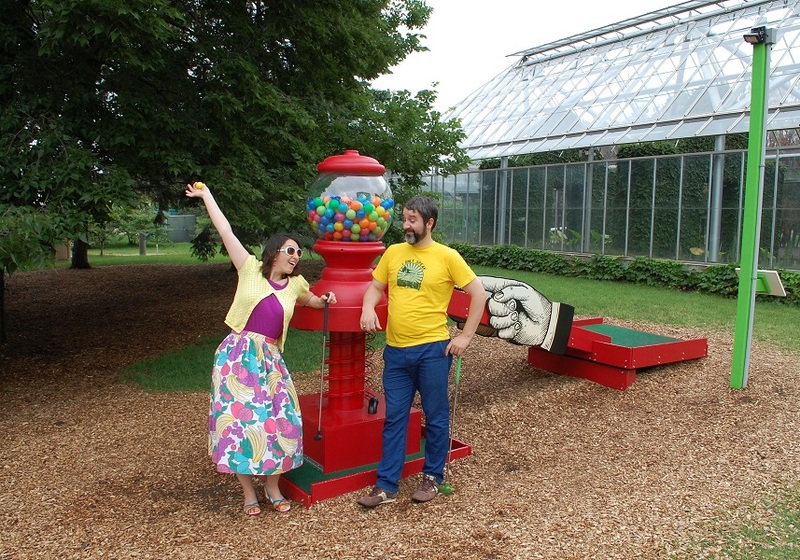 We've been involved with the Walker's Artist-Designed mini golf since the Fall of 2012. Scott Stulen and Jehra Patrick of the Walker were aware of our growing passion for mini golf and we were asked to present about the early adventures of our mini golf blog, A Couple of Putts, at an informational session for artists considering submitting proposals for an Artist-Designed mini golf course to open in May of 2013. At this point, we had only played 30-40 courses but had a deep passion for the intricacies and design of the game. Robin had already been a practicing artist for a number of years and at that point made large works of playful art that filled up our yard. Designing and building a mini golf hole was a natural opportunity for her to make more work and well within in her wheelhouse. Can You Handle This? [the name of their minigolf hole] was selected for the 2013 course and it was built by Robin, with some help from Tom, during the winter and it debuted on the course in May of 2013. The open ended theme for the course was "Garden" due it's location in the Minneapolis Sculpture Garden. The Walker continued to add holes in 2014 & 2015. Robin designed "Don't Blow It!" for the 2014 course and Tom collaborated on the design of 4 holes that were added 2015 in conjunction with the Walker's International Pop Art exhibition. Several of those holes continue to be featured in the current iteration on the roof of the Walker Art Center this Summer . Scott Stulen from the Walker Art Center moved to Indianapolis to work at the IMA and asked us to help them with the national call for artists to design a course that opened this Spring 2016. The theme for the course was "Indiana" in conjunction with state bicentennial and after giving it much thought, we joyfully submitted a hole featuring one of our favorite Indiana residents: Lil Bub. Tom had met Lil Bub in Minneapolis through his human companion, Mike, and we asked Bub if she would be ok using her likeness. She not only gave us the OK but came up with the name for the hole: Lil Golf. The idea was accepted and we built this hole in our basement throughout the winter months and transported it to Indianapolis this past Spring. What do you think minigolf means to the art world? What about art to the minigolf world? As a game, mini golf offers a open canvas for artists to explore numerous design and fabrication styles. Given it's a democratic game that is accessible to a wide range of people, an opportunity exists for artists to potentially engage some of those people who feel intimidated by art or the contemporary art world. Big museums are struggling to engage diverse and broad audiences and mini golf can be offer a bridge to getting people to consider art in their lives. Both the IMA and Walker offer both mini golf and the museum for one price. It could seem like an odd coupling from the outside but museums have seen it draw in larger audiences than most of their exhibits. It's also not a bad way to generate income for other arts activities for museums and other organizations. Artist-designed courses have opened up an opportunity for a new generation to see and play the game [of minigolf] in a new light that may further legitimize it as a sport. The game has seen a lot of shifts in popularity and we feel the artist-designed movement has helped the game regain some popularity in the US. The art world also gives mini golf an opportunity re-evaluate common tropes and design styles. The look of mini golf has naturally evolved over time but artist-designed courses have pushed both the look and the play to new levels. As people who are driven to the visuals of the game, we see this a big plus. Editor�s Final Note - A longstanding �problem� in the US is that the majority of the population views minigolf as fun and artistic versus a serious competitive sport. As A Couple of Putts points out above, these art courses are great to bring more people into the circle of minigolf with the fun designs, but it�s a double-edged sword in that it might take them further away from the less artistic, more competitive eternite, concrete and felt courses, especially since these don�t exist in the US. Perhaps the next step is to incorporate the two!